A bike is the most common vehicle that your child will ride when they’re still young. It’s fun, it’s good exercise and it helps them get around when playing with friends or going to the store. It’s a universal vehicle with a lot of uses and the skills they learn can be transferred to larger bikes when they’re older. Your kids will likely be happy that they can finally join their friends when you buy them a bike, but there are other exciting ways to get around too. So instead of getting them something predictable, take a look at these following examples for exciting alternatives. With any luck, even you will be convinced to try one of these unique alternatives to the traditional bike. Almost everyone knows what a skateboard is. They’re often associated with punk and urban culture and they’re used for all kinds of tricks. 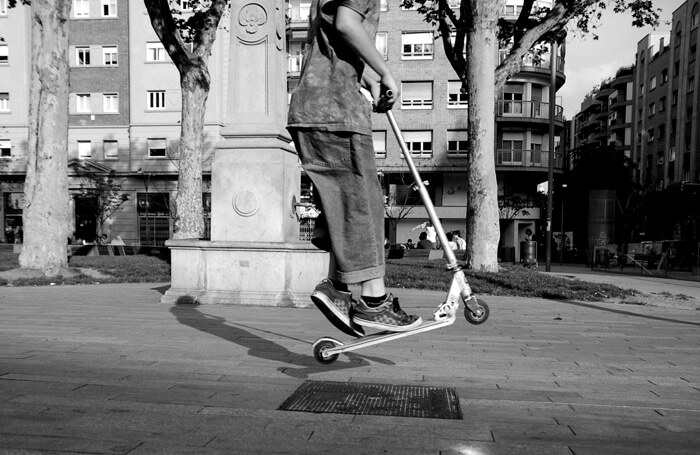 However, using them as a method of transportation is also viable, and many children are starting to get hooked on skateboarding culture due to its dual use as a fun sport and a unique way to get around. Skateboards are inexpensive, yet they can also be fairly pricey depending on what kind of wheels and wood you get. As a result, it’s fine to buy a cheap skateboard for your child to learn with before investing in something a little more expensive. It makes a fantastic gift and can be easily stored, so it won’t get in your way or cause trouble like a bicycle. Be warned, however. If your child wants to learn tricks on a skateboard, then expect them to be covered in bruises and cuts even if you buy them plenty of safety equipment. Learning to do tricks on a skateboard is difficult and requires a lot of work, which is why it’s not recommended without your supervision. It’s also relatively unsafe compared to other forms of transportation, so if you live on a busy street or close to dense traffic, it’s not recommended to give your child a skateboard as a method of transportation. The other option is to get a longboard. These are, as the name might imply, much longer than regular skateboards and often come with electronic variants. These aren’t designed for tricks but more geared towards transportation. Electric skateboards are fairly expensive, however, so they can be a costly investment as a gift to give your children. You also need to keep in mind that these need to be recharged, making them suitable only for a short amount of time if you want to use their full electric mode. Electric scooters continue the trend of electricity-powered vehicles. This makes them easier to operate and they tend to go faster than manually operated scooters. There are many different varieties, all with different types of designs, speeds and build quality. You can find an electric scooter for kids at almost any toy store, but they can also be found at specialised stores too. If you want something basic for your children, then it’s recommended to get a cheap one so they can get a feel for how an electric scooter works. It’s a lot different than manual ones, so there’s a slight learning curve before they can use them as transportation. Unlike skateboards, scooters need to be adjusted to the size of the rider, which means if your children are quickly growing up then they may outgrow their scooter if you decide to invest in an expensive one for their size. There are many other features to look out for, such as battery life and speed, so it’s recommended that you do as much research as possible so you can find the best fit for your child. Segway boards are controlled using your body’s weight. By leaning forward slightly, the self-balancing board remains stable while the wheels rotate and push you forward or backwards. To turn, you simply shift the weight of one side of your body. It sounds strange, but after a couple of tries it will become self-explanatory and you’ll be able to ride it naturally. For children, it be an even steeper learning curve due to how unnatural it feels at first. When these first became popular, the market was filled with cheap imitations with poorly installed batteries that could ultimately lead to these boards exploding or catching on fire. Sadly, many of these issues happened due to faulty batteries and cheap parts, so if you’re going to buy a segway board for your child, make sure it’s made from quality parts and not cheap imitation parts. Aside from the learning curve and worries that you might have with cheaper imitations, segway boards are an exciting alternative to a bike because of how unique it is and how much fun it can be to ride one. They do require charging for long periods of time and aren’t suitable for long distance rides (no electric vehicle is!) so only buy one if you just want your child to get out and have some fun. If you want a viable alternative to a bike as a method of transportation, then the segway board is not a good fit. Hopefully, this article has given you some insight into what makes a good alternative to a bike. There are several other options, but these are the most commonly bought ones for children to use due to their relative safety, cost and ease of use. They also look fantastic and are a lot of fun, making them unique options for both transportation and enjoyment. These alternatives also come in adult sizes, making them great for riding together or in groups. Make sure you remember your safety equipment and give your child some time to practice how to use each thing before you let them out alone.